The broad vision of the Our Place Wye programme is to develop a complementary, asset-based approach that promotes community health and wellbeing. More specifically, to integrate local projects that enhance healthy, active lifestyles, support independent living, increase personal and community resilience, and provide a good quality of life for residents of all ages. "promoting good health rather than treating poor health"
The Our Place Wye programme focuses on a population some 8,500 people, a quarter of whom live in the village of Wye. The remainder live across an area of over 100 square miles, in small villages, hamlets and farms. 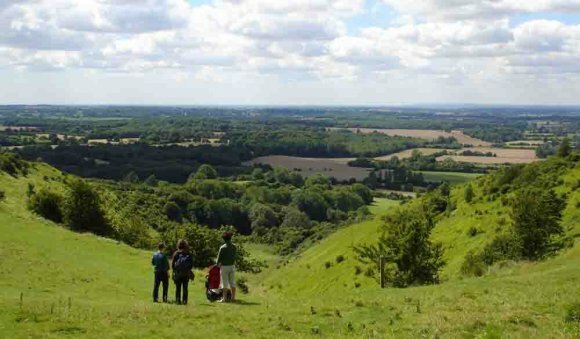 Wye and almost all of the surrounding settlements are in the Kent Downs Area of Outstanding Natural Beauty (AONB). The high quality environment and tranquility of the Downland landscape enhances wellbeing, and the extensive network of footpaths throughout the AONB facilitates healthy walks in the fresh air. However, the relatively isolated and scattered settlement pattern, the narrow lanes, and hills combine to present a challenge for both service providers and less mobile residents, both young and old. "The science and art of promoting and protecting health and well-being, preventing ill-health and prolonging life through the organised efforts of society." Unlike healthcare, social care is means tested. Kent County Council must ensure that it commissions free social care services that reach all those people who are eligible. However, most people do not qualify for free care, instead KCC must provide them with the information that they need to buy their own care privately. "...In England, the poorest people can expect to become ill or experience disability 17 years earlier than the most well off, and can expect to die seven years earlier." "Older people are particularly vulnerable to social isolation and loneliness owing to loss of friends and family, mobility or income." Our Place Wye aims to implement a range of preventative measures that will benefit individuals' health and wellbeing. These will enable people to live independently and remain active for longer, maintain their social networks and enjoy a better quality of life for as long as possible. These simple, preventative measures will also provide direct cost savings for health and social care services. For example, isolated and lonely people have an increased risk of suffering from depression, and hardening of the arteries, leading to higher blood pressure and risk of stroke and heart attack. They also suffer from higher all-cause mortality, and have higher rates of cancer and heart disease. The Our Place Wye Business Plan sets out how the programme should develop a robust and appropriate governance structure, and prepare for its operational stage. This will be managed locally through a new community social enterprise, or co-operative organisation. The final constitutional form and details are for the Programme Management Group to determine. However, as a locally focused, jointly owned operation where 'one member one vote' ensures local democratic control, this new body should set out to be flexible, lean and highly responsive to individual residents' needs. As a mutual it will be constituted to retain its trading profits for community benefit, and to create local employment. The International Co-operative Alliance (ICA) Statement on the Co-operative Identity defines a co-operative as: "an autonomous association of persons united voluntarily to meet their common economic, social and cultural needs and aspirations through a jointly owned and democratically controlled enterprise"
All co-operatives operate under the seven ICA co-operative values and principles. In summary, "co-operatives are based on the values of self-help, self-responsibility, democracy, equality, equity and solidarity. In the tradition of their founders, co-operative members believe in the ethical values of honesty, openness, social responsibility and caring for others." ICA.